In this step-by-step tutorial, I explain how to combine polymer clay with glass beads and metal bead caps for stunning one-of-a-kind focal mixed media beads. There are three sections in this tutorial. In the first one, polymer clay is used as a structure-holding material, with only metal and glass parts showing in the final design. This approach is demonstrated on an earrings project. 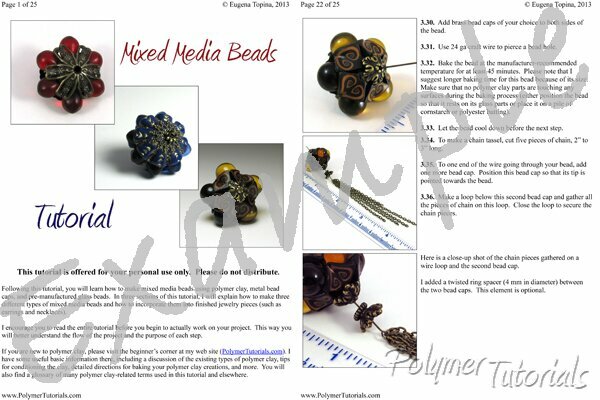 The second section demonstrates how to make mixed media beads with textured polymer clay design. In the third section, you will learn how to make mixed media beads using polymer clay canes. I show how to build the cane used for decorating the bead shown on the front page of the tutorial and share a few other ideas and possibilities of this technique. In addition to the detailed instructions for the bead-making process, I share in this tutorial how to wire-wrap these mixed media beads and explain how to make beautiful earrings and a chain tassel necklace using these amazing beads. As usual, the tutorial includes a complete list of tools and materials. I also provided a number of additional tips and notes to guide you through these projects. Place a mouse over the small pictures above to see them enlarged.